The topology of the Maxxed-Out Phono Preamplifier has been the mainstay of K&K Audio phono preamp kits since 2003. We have relentlessly worked to substantially improve the sonic performance of this topology through the use of improved component parts and additions to the basic topology that have removed performance limitations. It has become more and more electronically sophisticated with every sonic improvement, however, there has been a downside to this process. The one negative consequence of this process has been the increased difficulty of assembly, which has reached the point where we realized that a new approach was necessary. 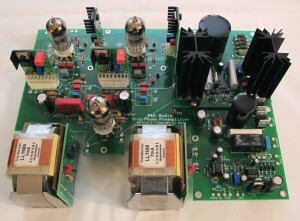 While the Maxxed-Out Phono Preamplifier is still available as an assembled, tested, and burned-in product, a new phono preamp kit called the Trio as taken its place for DIYers. As a DIYer you will still be able to get a phono preamp that can keep up with the best mid-priced (~$5K) phono preamps out there, but for a much more manageable price! The Trio Phono Preamplifier uses a couple of mechanisms to reduce the assembly complexity and cost while still delivering sonic excellence. First, the topology of the phono preamp was designed to minimize the number of sonically influential capacitors in the circuit. The best capacitors tend to be very expensive, so they work against a lower priced product. It took months of experimentation, but the finished design gives excellent sonic performance with moderately priced capacitors. Second, the most complicated parts of the circuit, the first and second stage plate loads, and the high voltage shunt regulator are preassembled, tested, and adjusted. These install to the main PC board with either high quality connectors or a few wire jumpers. These “modules” are the source of most of the assembly failure risk and we have taken that risk out of the process. You might ask at this point, how big is the sonic difference between the Trio and Maxxed-Out Phono Preamps? The Maxxed-Out Phono Preamp is still the star, and gives significantly better performance principally in two areas: musical detail resolution and creating the image of the performers in a believable space. However, the Trio offers an alternative to the Maxxed-Out Phono Preamp that is voiced much like its bigger brother, but is slightly warmer in character and is less relentless in the exposure of an LP’s faults, be they recording or condition related. The Trio is good at allowing the listener to explore less familiar elements in familiar music, like a subtle harmony line or the intricacies of the drummer’s stick work, while still affording the appreciation of the whole. In recordings that contain the information, the Trio supports substantial soundstage width and depth, with very good resolution of the performers in the recreated space. This is not a “flat earth” phono stage! While there are many possible approaches to designing a phono preamp with adequate gain and low enough noise and output impedance, we chose to use a three stage design using the ubiquitous 6922 dual triode (or equivalents). The first and second stages provide the bulk of the gain while the output stage is configured to provide low output impedance and overall gain adjustment. The first stage consists of a quiet triode amplifier operated in “fixed” bias configuration. The principal advantage of this technique is the avoidance of the cathode bypass capacitor and its sonic signature. The second stage is similar to the first, but employs a different plate load circuit. The first stage uses a MOSFET-based cascode current source load, while the second stage uses a bipolar transistor DC stabilized, AC high impedance plate load. The second stage plate load circuit was selected to provide a well-controlled DC plate voltage for the second stage, so that yet another signal path capacitor (coupling between the second and third stages) could be avoided. The third (output) stage is directly coupled to the second stage and is loaded with a Lundahl plate transformer. The output transformer provides impedance transformation to ensure a low output impedance and also makes possible both balanced (XLR) and unbalanced (RCA) output connections without additional circuitry. The RIAA equalization function is split and executed partly between the first and second stages and the second and third stages. The power supply, which is also critical for good sound, uses a choke loaded design for lowest rectifier noise and sports a very high quality shunt-type voltage regulator for the high voltage supply to remove power line variations and noise from the sonic equation. Grounding on the PC board is carefully executed to separate power supply bypass grounds from audio signal grounds. We found that the nature of the power supply to the tube filaments had a substantial effect on the sound of the phono preamp. While AC filament supplies sound very good, the low level residual hum was not desirable, so a passively filtered DC supply is used for the first two stages, while the output stage uses an AC filament supply. For low to medium output MC cartridges or low output MI cartridges an additional means to increase the signal level is needed, because it is very difficult to amplify the microvolt level signals present at the output of most moving coil phono cartridges without adding intrusively audible tube noise. A step-up transformer can do the job admirably without adding any perceivable noise. If you need low/medium MI/MC cartridge capability you can add MC input transformers to the input of the Trio in two ways. The first is by means of a pair of LL9226 or LL1678 MC input transformers and MC input PC boards, affixed to the inside of the back panel and wired into the main board and two RCA jacks, giving you dedicated MC inputs (and no MM inputs). The second way (MC/MM Phono Input Option) provides the Lundahl MC input transformers of your choice, but also adds an 8 position MC loading switch and resistors, as well as retaining the switchable MM inputs through separate RCA jacks. The K&K Audio Trio Preamp Kit is not strictly a “newbie” kit, but can be constructed successfully by anyone with good mechanical skills and some soldering experience. You must have a soldering set-up, reliable voltmeter, and appropriate hand tools, and be able to tell the difference between a resistor, a diode, and a capacitor, as well as follow detailed instructions supported with numerous photographs. Included with the kit is a detailed step-by-step instruction manual. K&K Audio stands behind you as you build with telephone/e-mail support, and, if necessary, will finish/troubleshoot a complete kit for a modest time-based fee. To give you further choices, you have the option of purchasing either a Main Board Kit (main PC board, all PC board mounted parts, tubes, and LL1689/7mA output transformers; price $625) to which you must add power supply magnetics, switches, connectors, and an enclosure, etc. ; or a Complete Kit (price $1250), which includes all of the parts necessary for a complete phono preamplifier, except the solder, tools, and the time to assemble it. It is also possible to have your kit professionally assembled for an additional charge. Furthermore, you can add function options to your kit as described below to enhance its usefulness in your music system. The dimensions of the main PC board are 8.0” (20.3cm) deep x 10.5” (26.7cm) wide. The output transformers add about 0.25” (1cm) to the depth. The height of the assembled PC board without the necessary stand-offs (not included in the kit) is approximately 2.8” (7.1cm). The Complete Trio Kit is equipped with a matte black powder-coated front panel supporting the Power and Mute/Operate switches. The finished dimensions of the kit are 18″ (46cm) wide, 13″ (33cm) deep, and 4″ (10cm) high. The Trio Kit weighs about 21 lbs. (9.5kg).